Kudos to you if you caught the link/picture combination-joke in there. 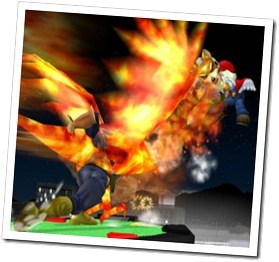 Falcon PUNCH! It’s been a busy couple nights since I got back. My loot mojo has been off mightily; while I’ve managed to get none of the items I actually want to get (and with the latter, I’m thinking it’s because it doesn’t drop on heroic at all), I have managed to pick up a number of off-spec tanking-oriented items (actually, I lost a roll for the bindings, and I think I may have auctioned the cape, but I digress). At this rate I’m going to be defense-capped (on a spec I don’t use) well before I ever step into a raid (where I am not a tank). Someone give me back my loot mojo! At least I’ve gotten some other things done. Hit revered with the Knights of the Ebon Blade, so I can now apply their snazzy head enchant to any helmets I happen to get tossed my way… now to try and hit exalted to get the boots. Only a few more heroics, I suppose, so maybe by the end of the week. We did On the Rocks on a whim last night, and I can safely say to anyone thinking of trying it: as long as your healer isn’t stupid, you can do it. We killed Keleseth fast enough that he only laid down two Ice Tombs; the first was me (and I had popped Icebound Fortitude just in case…), while the second was the healer (at which point both of the death knights in the party popped Army of the Dead to take some of the heat off the tank). That sucker never saw what was coming to him. A’dal gave me a Green Trophy Tabard of the Illidari, which I replaced with the purple one. If you’re looking to do the same thing, destroy yours (honest, this is how it works!) then go to any tabard vendor (at least in the major old-world cities; your mileage may vary elsewhere) and they should offer conversation options to replace your trophy tabard of the Illidari. Oh, and last but not least, I started a widdle bitty baby druid. My cousin has recently decided to roll on Feathermoon, and since she doesn’t have a Horde character to transfer over, she’s rolled up a new tauren shaman - so I said I’d roll a tauren druid to keep her company, and I did! Nearly to level 10, so he’ll probably get a link soon in my armory links. I have to admit I’m having a lot of fun, even at level 9 - I haven’t played a druid since back when I was an utterly clueless nubcake, and WoW was actually hard. But… that’s a story for another post, right?